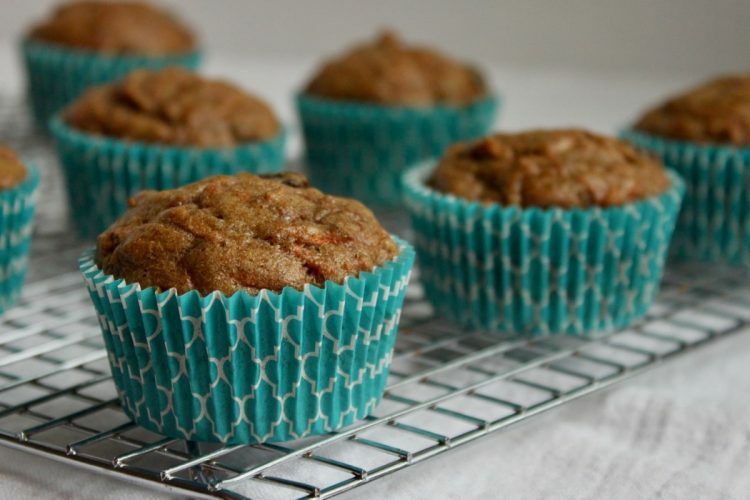 These healthy morning glory muffins are my preschooler’s favorite snack. We bake a batch of these morning glory muffins at least weekly for his school lunch or a quick on-the-go snack. 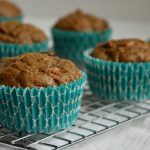 Thankfully, these morning glory muffins are healthy: 100% whole grain, low in added sugar, and a delicious way to add extra fruits and vegetables to your day. These morning glory muffins are not simply a frosting-free cupcake loaded with added sugar and refined flour. Each little muffin contains almost a full serving of fruits and veggies. 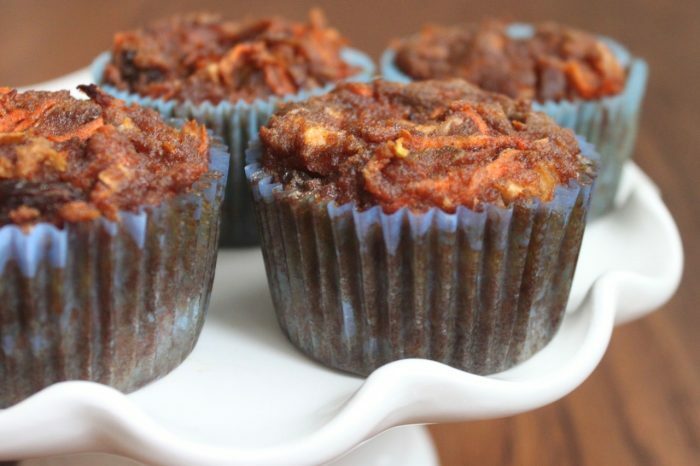 The increased amount of carrots and apples in the recipe allows for a reduction in total added sugar while still creating a sweet and tasty muffin. The result is an overloaded morning glory muffin that is super moist, dairy-free, and low in added sugar (just 4 grams or 1 teaspoon per muffin). My preschooler loves to cook with me. His two favorite foods to make are these healthy morning glory muffins and protein-packed pancakes. Though cooking with kids is often messy and time consuming, there are many benefits of cooking with children. Involving kids in meal preparation not only increase the likelihood that they will eat (or at least try) the meal, it also provides an opportunity to talk with children about healthy ingredients. For more information, check out this NY Times article on 5 reasons you should cook with kids. 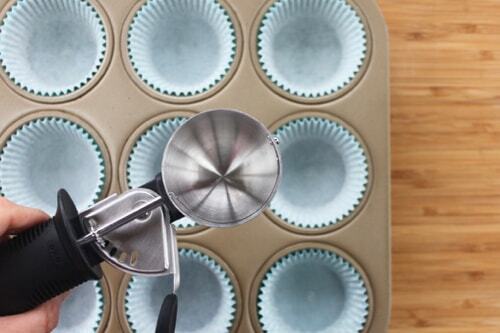 I use an ice cream scoop when filling the muffin pans with batter. I find that this is an easy, mess-free way of creating uniform size muffins. These healthy Morning Glory Muffins are a delicious way to sneak extra veggies and fruit into your day. These Overloaded Morning Glory Muffins can also be made with coconut flour instead of whole wheat flour. Coconut flour is naturally gluten-free and higher in fiber than regular whole wheat flour. * Peel carrots and apple if not using organic as they consistently test positive for high amounts of pesticide residues. Read more on pesticides and produce. ** I choose to purchase non-GMO canola oil because 94% of canola grown in the US is genetically engineered to be herbicide tolerant (i.e. it will keep growing when sprayed with chemicals such as glyphosate (Roundup®)). In Canada, 95% of canola is genetically engineered. Read more on genetically modified foods. This recipe was originally published on February 23, 2017. The recipe has been updated with enhanced instructions including a simpler one-bowl preparation. Refreshed photos were also added. I can’t wait to try these. I’m going to try them as- is today, but I’m wondering if you think I could replace the eggs with flax or chia? Thanks for posting such a bomb recipe with amazing ingredients, easy conversions and cool tips for baking with kids ! Hi Olive, Thank you so much – I hope you love the muffins! I have tried making these muffins with flax instead of eggs. I didn’t love the results… they fell apart a little too much imo. I haven’t tried chia as a replacement however, and I don’t have a lot of experience with replacing eggs with flax. So if you try either, I would love to know your thoughts! Love how many fruits & veggies you packed into this! These look amazing, and what an adorable photo of your son! Thanks for sharing! Thanks Lizzie! I hope you enjoy the muffin recipe as much as we do! These muffins sound delicious! Our mornings have been getting busier, so having something quick to just grab-and-go would be perfect. Especially a breakfast that contains all these veggies 😉 ! Thanks Kelli! I don’t know what we would do without easy grab and go breakfasts! I hope you enjoy these morning glory muffins as much as we do! Sonia – I hope the muffins turned out well and everyone loved them. We are on batch two for this week… they are my preschooler’s favorite “snacky” breakfast right now. 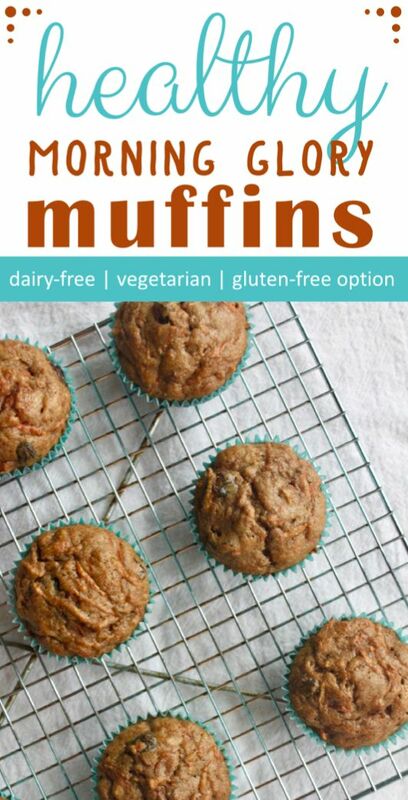 Michelle – Zucchini muffins are definitely next on my list. 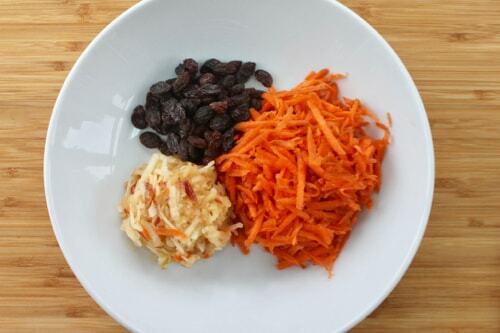 I am all about sneaking veggies into meals (for adults AND kids)! Yay for these being gluten free, I think my kids would love these for breakfast! 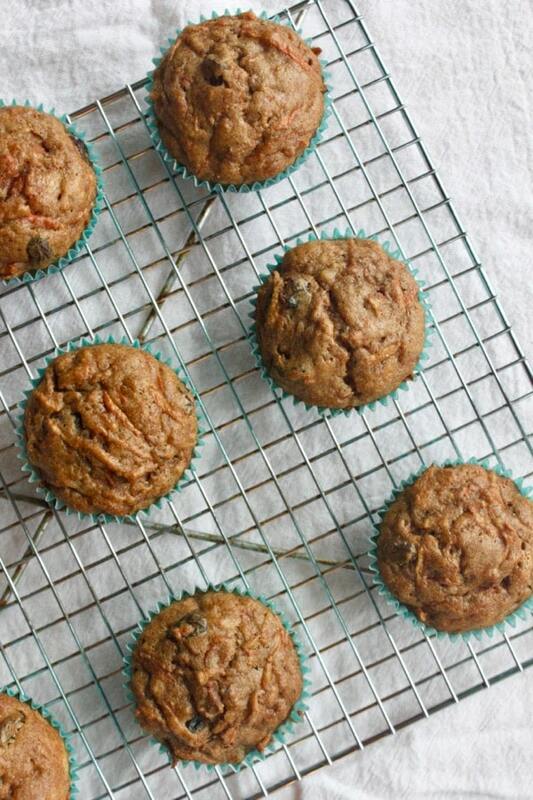 Thanks Cindy – The coconut-y flavor in the gluten free version of these muffins is so delicious. I hope your kiddos love them too! Nice! They look like they totally packed with carrots and apples! Great way to sneak in veges for my picky son! Ha Ha – Yes Beth! I my youngest is a carb-lover and I make these muffins all the time to sneak some extra fruit and veg into his day! Sneaky! I did this same trick when my kids were little … they sometimes turned up their noses at vegetables, but never at muffins!! My son was a great muffin baker when he was 3-5 years old … we’d sing “Do you know the Muffin Man?” and mix up batter. Noel – Yes, hidden veggies are definitely a necessity for my 3 yo. We love singing the “muffin mom” song while we bake together. Thanks for reading! I love how loaded these muffins are with carrots and apples. Do you know if you can freeze them? Hi Jill – yes, these muffins can be frozen. However, I like to freeze the pre-scooped batter BEFORE baking. That way, we enjoy warm, freshly baked muffins whenever we want (just increase the baking time by ~ 5 minutes). Love these loaded muffins! I like to start day with these kinds of muffins, rich in veggies and fruit. I haven’t baked with coconut flour, I need too. Thanks Swathi! Coconut flour provides a nice, nutty flavor to these muffins, though it can not be used in a 1 to 1 substitution for whole wheat flour. These muffins look sooo delicious! They are one of my favorite – so packed with veg and fruit! You can buy already grated carrots. Is is better if I grate my own? I would love to know more about your choice of oil. I can’t wait to make these gluten free. The only reason I would choose grating carrots yourself over buying pre-grated carrots is because of flavor. I prefer the taste of freshly grated carrots (this is the same reason I will make carrot sticks from whole carrots instead of buying “baby” carrots). Oil choice… I like to use a predominantly unsaturated oil and prefer the neutral flavor that avocado (or an acceptable canola) oil provide. For more information on dietary fats, check out this post: https://feedthemwisely.com/dietary-fat-experts-think Thanks for reading Judi!